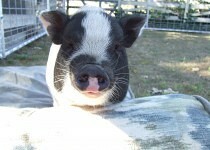 BrightHaven > Blog > Events > Fundraising > The BrightHaven Pigs Need YOUR Help Now! Drenching rains in Northern California? That’s so hard to believe based on recent hot weather and an ongoing drought. 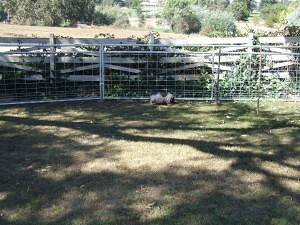 However, with an El Niño winter just around the corner, we knew we had to jump into action to keep our two gorgeous pig girls, Boots (left) and Gracie, safe from these soaking storms! 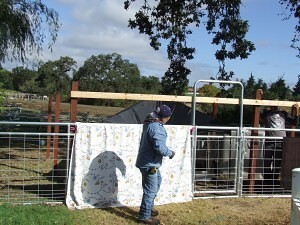 Building a sturdy shelter to keep our lovely ladies protected from bad weather is not inexpensive. We need to raise $1500 to pay for lumber & labor by November 1st! We are forever grateful to you, our bighearted supporters. Without you, we couldn’t give animals the gift of tomorrow! Gracie was named for the miraculous way she found her way to BrightHaven in February 2015 after being orphaned by the side of the road at about 5 days old! We quickly learned how to be “pig parents” as orphaned piglets only have a 50-50 chance of survival in their early weeks–they must be kept in 90 degree heat for the first month, 24-7. Gracie is thriving and loves sleeping in her dog bed, swimming in her pool when it’s hot and eating veggies. She is also very smart! 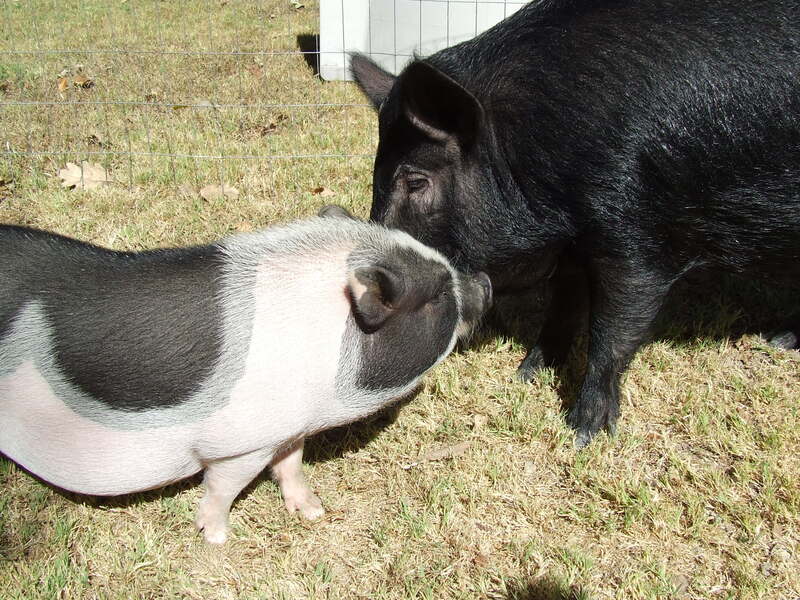 We decided that Gracie needed a piggy friend and found beautiful 4-month-old Boots on Craigslist in August 2015. She was also an orphan and the kind human who found her did not have the right living arrangements to keep her. Not only is Gracie excited to have Boots for her new BFF, we’re thrilled that we could save Boots from an uncertain fate. She is a feisty lass who loves her swimming pool, watermelon and cuddles. What is the One Book Every Animal Lover Should Own?